Form 762 or the "Return Of Tangible Personal Property, Machinery And Tools, And Merchants' Capital" is a form issued by the Virginia Department of Taxation. 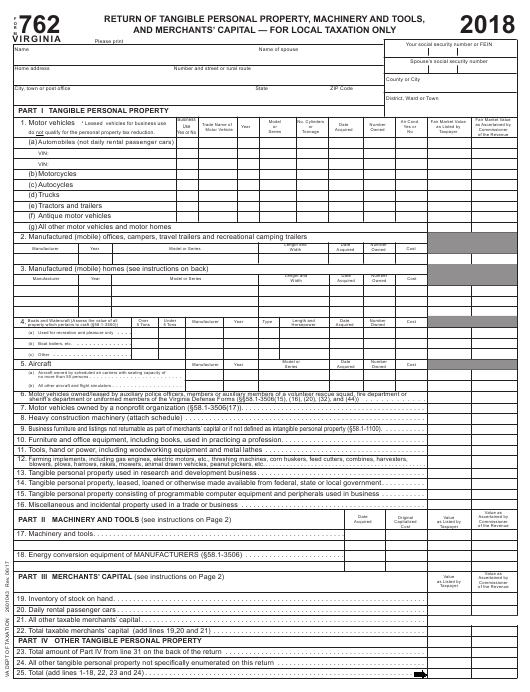 Download a fillable PDF version of the Form 762 down below or find it on the Virginia Department of Taxation Forms website. do not qualify for the personal property tax reduction. no more than 50 persons . . . . . . . . . . . . . . . . . . . . . . . . .
(b)	All	other	aircraft	and	flight	simulators	. . . . . . . . . . . . . . . . . . .
sheriff’s	department	or	uniformed	members	of	the	Virginia	Defense	Forms	(§§58.1-3506(15),	(16),	(20),	(32),	and	(44))	. . . . . . . . . . . .
7. Motor	vehicles	owned	by	a	nonprofit	organization	(§58.1-3506(17)) . . . . . . . . . . . . . . . . . . . . . . . . . . . . . . . . . . . . . . . . . . . . . .
8. Heavy construction machinery (attach schedule) . . . . . . . . . . . . . . . . . . . . . . . . . . . . . . . . . . . . . . . . . . . . . . . . . . . . . . . . . . . .
9. Business furniture and listings not returnable as part of merchants’ capital or if not defined as intangible personal property (§58.1-1100). . . . . . . . . . .
10. Furniture	and	office	equipment,	including	books,	used	in	practicing	a	profession . . . . . . . . . . . . . . . . . . . . . . . . . . . . . . . . . . . .
11. Tools,	hand	or	power,	including	woodworking	equipment	and	metal	lathes . . . . . . . . . . . . . . . . . . . . . . . . . . . . . . . . . . . . . . . .
blowers,	plows,	harrows,	rakes,	mowers,	animal	drawn	vehicles,	peanut	pickers,	etc. . . . . . . . . . . . . . . . . . . . . . . . . . . . . . . . . . . . . . . . . . . . . . .
13. Tangible personal property used in research and development business . . . . . . . . . . . . . . . . . . . . . . . . . . . . . . . . . . . . . . . . . .
14. Tangible	personal	property,	leased,	loaned	or	otherwise	made	available	from	federal,	state	or	local	government . . . . . . . . . . .
15. Tangible personal property consisting of programmable computer equipment and peripherals used in business . . . . . . . . . . .
16. Miscellaneous and incidental property used in a trade or business . . . . . . . . . . . . . . . . . . . . . . . . . . . . . . . . . . . . . . . . . . . . . .
17. Machinery and tools . . . . . . . . . . . . . . . . . . . . . . . . . . . . . . . . . . . . . . . . . . . . . . . . . . . . . . . . . . . . . . .
18. Energy conversion equipment of MANUFACTURERS (§58.1-3506) . . . . . . . . . . . . . . . . . . . . . . . . .
19. Inventory of stock on hand . . . . . . . . . . . . . . . . . . . . . . . . . . . . . . . . . . . . . . . . . . . . . . . . . . . . . . . . . . . . . . . . . . . . . . . . . . . . . .
20. Daily rental passenger cars . . . . . . . . . . . . . . . . . . . . . . . . . . . . . . . . . . . . . . . . . . . . . . . . . . . . . . . . . . . . . . . . . . . . . . . . . . . . .
21. All other taxable merchants’ capital . . . . . . . . . . . . . . . . . . . . . . . . . . . . . . . . . . . . . . . . . . . . . . . . . . . . . . . . . . . . . . . . . . . . . . .
22. Total	taxable	merchants’	capital	(add	lines	19,20	and	21) . . . . . . . . . . . . . . . . . . . . . . . . . . . . . . . . . . . . . . . . . . . . . . . . . . . . .
23. Total amount of Part IV from line 31 on the back of the return . . . . . . . . . . . . . . . . . . . . . . . . . . . . . . . . . . . . . . . . . . . . . . . . . .
24. All	other	tangible	personal	property	not	specifically	enumerated	on	this	return	. . . . . . . . . . . . . . . . . . . . . . . . . . . . . . . . . . . . .
25. Total	(add	lines	1-18,	22,	23	and	24) . . . . . . . . . . . . . . . . . . . . . . . . . . . . . . . . . . . . . . . . . . . . . . . . . . . . . . . . . . . . . . . . . . .
26. (a)	Horses,	mules	and	other	kindred	animals . . . . . . . . . . . . . . . . . . . . . . . . . . . . . . .
(b) Cattle . . . . . . . . . . . . . . . . . . . . . . . . . . . . . . . . . . . . . . . . . . . . . . . . . . . . . . . . . . .
(c) Sheep and goats . . . . . . . . . . . . . . . . . . . . . . . . . . . . . . . . . . . . . . . . . . . . . . . . . .
(d) Hogs . . . . . . . . . . . . . . . . . . . . . . . . . . . . . . . . . . . . . . . . . . . . . . . . . . . . . . . . . . .
(e)	Poultry	—	chickens,	turkeys,	ducks,	geese,	etc. . . . . . . . . . . . . . . . . . . . . . . . . . .
(f) Equipment used by farmers or cooperatives to produce ethanol derived primarily from farm products . . . . . . . . . . . . . . . . . .
(g) Grains and other feeds used for the nurture of farm animals . . . . . . . . . . . . . . . . . . . . . . . . . . . . . . . . . . . . . . . . . . . . . . . . . .
(h)	Grain,	tobacco	and	other	agricultural	products	in	the	hands	of	a	producer . . . . . . . . . . . . . . . . . . . . . . . . . . . . . . . . . . . . . . .
(i) Equipment and machinery used by farm wineries in the production of wine . . . . . . . . . . . . . . . . . . . . . . . . . . . . . . . . . . . . . .
27. Felled	timber,	ties,	poles,	cord	wood,	bark	and	other	timber	products . . . . . . . . . . . . . . . . . . . . . . . . . . . . . . . . . . . . . . . . . . . . .
28. (a)	Refrigerators,	deep	freeze	units,	air	conditioners	and	automatic	refrigerating	machinery . . . . . . . . . . . . . . . . . . . . . . . . . . . .
(b)	Vacuum	cleaners,	sewing	machines,	washing	machines,	dryers	and	all	other	household	machinery . . . . . . . . . . . . . . . . . . .
(c)	Pianos	and	organs,	television	sets,	radios,	phonographs	and	records	and	all	other	musical	instruments . . . . . . . . . . . . . . . .
(d) Watches and clocks and gold and silver plates and plated ware . . . . . . . . . . . . . . . . . . . . . . . . . . . . . . . . . . . . . . . . . . . . . . .
(f)	Diamonds,	cameos	and	other	precious	stones	and	precious	metals	used	as	ornaments	or	jewelry . . . . . . . . . . . . . . . . . . . .
(g) Sporting and photographic equipment . . . . . . . . . . . . . . . . . . . . . . . . . . . . . . . . . . . . . . . . . . . . . . . . . . . . . . . . . . . . . . . . . . .
(h) Firearms and weapons of all kinds . . . . . . . . . . . . . . . . . . . . . . . . . . . . . . . . . . . . . . . . . . . . . . . . . . . . . . . . . . . . . . . . . . . . . .
(i)	Bicycles	and	lawn	mowers,	hand	or	power . . . . . . . . . . . . . . . . . . . . . . . . . . . . . . . . . . . . . . . . . . . . . . . . . . . . . . . . . . . . . . . .
(j)	Household	and	kitchen	furniture	(state	number	of	rooms ______ ) . . . . . . . . . . . . . . . . . . . . . . . . . . . . . . . . . . . . . . . . . . . . .
(k)	All-terrain	vehicles,	mopeds,	and	off-road	motorcycles . . . . . . . . . . . . . . . . . . . . . . . . . . . . . . . . . . . . . . . . . . . . . . . . . . . . . .
(l) Electronic communications and processing devices . . . . . . . . . . . . . . . . . . . . . . . . . . . . . . . . . . . . . . . . . . . . . . . . . . . . . . . . .
29. Seines,	pound	nets,	fykes,	weirs	and	other	devices	for	catching	fish . . . . . . . . . . . . . . . . . . . . . . . . . . . . . . . . . . . . . . . . . . . . . .
30. Poles, wires, switchboards, etc., telephone or telegraph instruments, apparatus, etc., owned by any person, firm, association or company not incorporated . 31. Toll	bridges,	turnpikes	and	ferries	(except	steam	ferries	owned	and	operated	by	chartered	company) . . . . . . . . . . . . . . . . . . . .
32. Total of Part IV (add lines 26 through 31 and enter on line 23) . . . . . . . . . . . . . . . . . . . . . . . . . . . . . . . . . . . . . . . . . . . . . . . . . . .
vehicle is leased by an individual and the leasing company pays the tax without reimbursement from the individual. capital	or	short-term	rental	property,	and	have	an	original	cost	of	less	that	$250. classification	for	all	such	machinery	and	tools. chandise,	which	tangible	personal	property	should	be	reported	as	such	on	front	of	this	return	under	PART	I.
certify	that	unless	otherwise	indicated	as	business	use,	the	vehicles	listed	herein	are	for	personal	use. Executors,	administrators,	trustees	and	other	fiduciaries	must	also	supply	information	called	for	on	this	return.